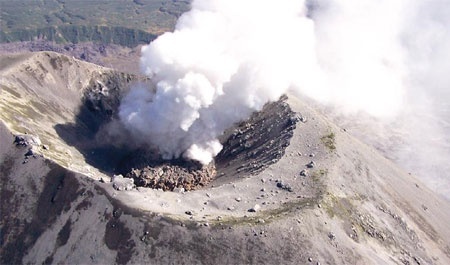 Eruptions take place in Kamchatka constantly from one of the 600 active volcanoes in the area. No less than three volcanoes at any one time are spewing out ash, pebbles, and plumes of smoke. They say that watching volcanoes is highly addictive. My husband and I checked this out: it’s true. By the time we arrived at the foothills of Mutnovsky, the clouds and fog had drawn a grey curtain between us and our first volcano. My imagination drew pictures of a classic, fuming cone-shaped volcano, dramatically throwing out red-hot rocks, with lava flows on the slopes. My first real volcano turned out very different from the classic Vesuvius or National Geographic version. I learned in Kamchatka that all volcanoes are different. 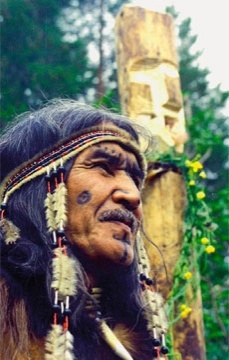 Each has its own character and shape. We had been hiking for quite a while along a dirt track up the mountain slopes, across tundra and immense snow patches, when Viktor, our local guide, suddenly stopped, waved his hand in front of us and announced “and here is the entrance to Mutnovsky crater”. My husband and I exchanged glances silently. No cone, no summit, only another wall of the mountain and an impressive vertical cloud of fog behind it? The fog was disappearing little by little, and by the time we entered the crater, the sun had started shining. The Mutnovsky crater (2,300m) turned out to be a huge, continuous fault in a mountain, with walls of incredible colours. At the bottom of the mountain there was a frozen lake, and an immense vertical plume of vapour was rising from the ground - Mutnovsky’s grand fumarole. We crossed the “fumarole field”, a small valley with outlets in the ground issuing white and yellowish vapour. 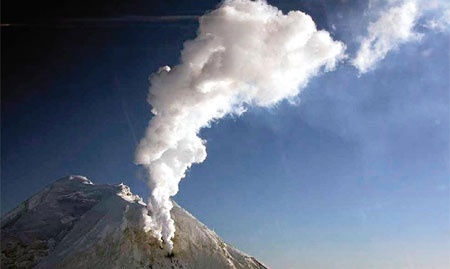 Some fumaroles are dangerous, the worst being those with a high content of carbon monoxide. 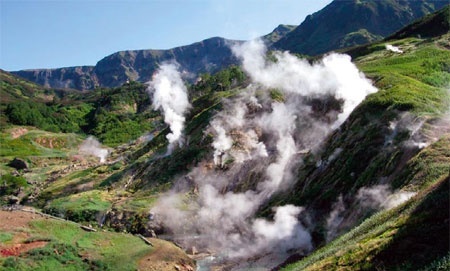 Locals a wary of fumaroles: because the wind can change, and sometimes colourless and odourless gas can envelope the unwitting human. We were lucky with the weather in Mutnovsky– we realized that clearly only the next day, when we climbed Gorely, (1800m), which has a crater of an amazing, surrealistic colour. But the creamy turquoise lake is not of harmless - fumarole gases go straight into the water making it acidic. After a three-hour trip straight up along the trail, we were at the edge of its crater. But, while we had been hiking towards it, the fog was catching up with us. Finally, we stood on the edge of the magnificent crater, peering into its depths, or trying to as it was hidden from us by dense white fog! We accepted that we would not see Gorely in its full beauty only after an hour-long walk along the crater edge, when we felt the volcano as an independent and majestic living being, with its own breath of fumaroles, unexpected sounds of rocks falling, its own mood - and the weather! There, on the top of Gorely, we made a resolution in future to ask every volcano before the ascent to allow us to see its wonders. It was Tolbachik that gave me an appreciation of the real scale of a volcano. It was there that the sixth-largest crack eruption on the planet took place. The way up north towards Tolbachik was simply exhausting. One needed incredible patience to bump 600km there in 4 x 4. We talked, tried to sleep and read, looked out of the window, slept again. Luckily, there were two short stops for a dip in the Malki hot springs and at a local market in the village! We were stunned when we finally arrived at Tolbachik. What a life - only tens, hundreds of kilometres of volcanic ash erupted by Tolbachik in 1975-76… Being there, one could easily imagine an 18-km column of ash and gases rising up from the volcano and eliminating all life around. It became clear why the area is described as being akin to the surface of the moon. Moreover, there was a small service place where we stopped called Lunokhodchiki (“moon-walkers”) to commemorate the testing of the first Soviet moon-walking machines there. The place gave an impression of being on another planet, abandoned and mysterious. At seven next morning, we started the hike up Tolbachik to reach its top before the midday fog. This was a long hike up to the crater. In fact, there are two Tolbachiks – the snow-topped Ostry (Sharp, 3680m) and the longish, flattened Ploski Tolbachik (Flat, 3100m), which was actually the goal of our trip. Its three kilometre wide crater was funnel-shaped, surrounded by a thick, permanent glacier. Stones from the walls rolled into its depths making a deafening noise, and a few fumaroles fumed angrily. This volcano was not as active as Mutnovsky but much more monumental. Nearby are caves created by underground lava flows, which left memorable scratches on my hands. Kamchatka’s logo is a volcano and a brown bear catching a salmon (sometimes instead of a bear there is a fisherman). 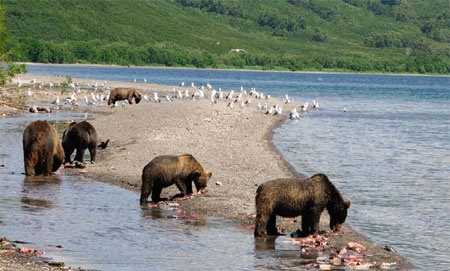 We were not that interested in salmon/loach angling, but Kamchatka’s wildlife sounded interesting, and it was, though not at the famous Kurilskoe Lake. I did not particularly welcome the idea of my husband meeting a brown bear (especially in the middle of the night), when I was the only one in the tent who was lying awake thinking of a bear catching the whiff of our fried sausages. Our guide’s instructions to make a loud din if a bear should approach was not very reassuring. But in Kamchatka seeing a bear was inevitable. In the daytime, the tundra is covered by a carpet of multicoloured flowers and berries that range from wild raspberry to bilberry and honeysuckle, and appear to be a good grazing area for a bear. Despite the scary tales of hungry bears attacking tourists all the time, young bears are usually careful, and it is a question who is actually afraid of who during a meeting. The first young bear we met got so involved in berry picking that he did not notice us until we were very close to each other. We did not see him either, so there was a moment of mutual discovery and wild panic from both sides. By the time I had managed to extract my camera and change the lens, the bear was too far away. He ran so quickly that it became crystal clear that it was useless to ever trying to compete with a bear in track & field athletics. Apart from another peacefully grazing bear, we met plenty of photogenic black-headed marmots, curious ground squirrels, hovering white-tailed sea eagles. While I never considered myself a “bird” person, an outing on a boat in the Avacha Bay was unlike anything I’d ever experienced. There were literally thousands of birds! - all shrieking, nesting, flying, rushing around, catching fish. A couple of seals and orca nearby completed the impression. Now I know that Kamchatka is really another planet. Not a single photo is able to render its fascination. You have to see it yourself.